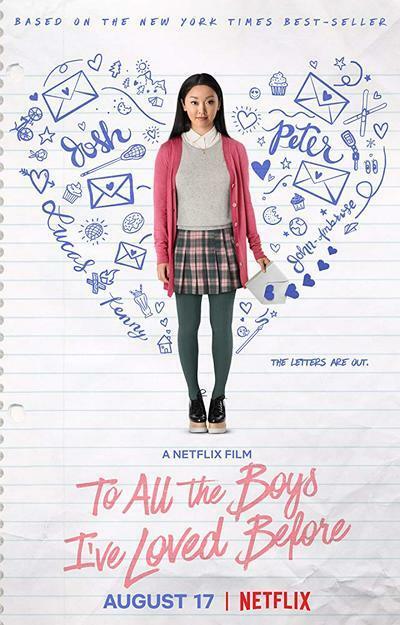 “To All the Boys I’ve Loved Before” is based on a best-selling YA novel by Jenny Han, and inspired by her own teen years, when she would write letters to the boys she had crushes on, but never send them. “I write a letter when I have a crush so intense that I don’t know what else to do,” Lara Jean (Lana Condor) tells us. The letters are more from her to herself than they are to the boys. She keeps them in a special box from her late mother and looks at them often. “Rereading the letters reminds me of how powerful my emotions can be, how all-consuming.” She reads them the same way she reads florid bodice ripper novels with names like The Forbidden Kiss. She says she reads them “for the camp,” but really reads them to imagine herself in a world of passion she is not yet ready to try for. In real life, her Saturday evenings are more often spent watching a “Golden Girls” marathon with her 11-year-old sister. The cute premise of this story is that the five letters written by Lara Jean mysteriously get mailed. Han and screenwriter Sofia Alvarez wisely decide to move briskly past that set-up, with only about ten minutes on the excruciating humiliation and no time at all on the mystery of how it happened. (The culprit is instantly obvious despite a half-hearted attempt at a red herring.) The story veers quickly into a conventional but charming high school romantic comedy. Lara Jean’s current crush is on Josh (Israel Broussard), her older sister’s boyfriend. But then Josh is suddenly single and lonely when Lara Jean’s sister Margot (Janel Parrish of “Pretty Little Liars”) breaks up with him as she is about to leave for college in Scotland. All the basics of a high school rom-com line up as though their names are being called out in home room attendance-taking. Lara Jean is relatably adorkable, smart but shy, missing her late mom but super-close to her two sisters and her doctor dad. She has a quippy best friend and a former BFF-turned nemesis, the all-around Mean Girl (“Riverdale’s” Emilija Baranac as Gen). When popular high school lacrosse star Peter (hunky yet somehow accessible and soulful Noah Centineo) receives her letter, Lara Jean literally faints from shame. As she sees Josh approaching, another one of her letters in his hand, she impulsively kisses Peter, and then offers him a deal. Gen just dumped Peter for a college boy. So maybe Lara Jean and Peter could pretend to be dating to awaken the interest of Josh and Gen! And maybe she can teach him the African Anteater Dance! No, sorry, that’s Patrick Dempsey in “Can’t Buy Me Love,” but you get the idea. We all get the idea. And that is fine. Some movies are there to surprise us; others are there to take us on a pleasant ride along a well-established route. This one is about 15 minutes too long. It could well have skipped the teen party at an enormous mansion and done with a less protracted misunderstanding. Other than that, it is a delightfully adorkable time. Condor is a true sweetheart, projecting a quiet warmth and wry humor. Her Lara Jean is shy, but not insecure. She is smart and, rare in a teenage girl character on screen, she is comfortable being smart. It is a pleasure to see the way she blooms as she begins to pretend and then own her real feelings. Her Korean-American heritage is a detail that adds some depth to the portrayal without ever becoming an issue in her relationships. The relationship between the motherless three girls and their widower father (John Corbett) has a natural ease tinged with loss that makes them hold on to each other just a little bit harder. Peter and Lara Jean have an easy rhythm, whether they are negotiating the terms of their fake romance, describing their favorite movies, or exchanging some painful confidences. Lara Jean has Peter watch the 34-year-old “Sixteen Candles” to teach him something about her idea of romance (and she frankly acknowledges it is completely racist). I can see some future teenage girl giving this film to a guy she likes instead.